NEW! QIDO - Qwerty to Dvorak USB Adapter. Our latest development in human interface technology, the Patent Pending QIDO is a small plug-in device which gives you instant control of your keyboard layout in hardware. Decrease the risk of typing related RSI by quickly learning the more-efficient and superior Dvorak layout. Our team demonstrated the latest technology developments in hardware keystroke monitoring (hardware keylogger) at CES FEDERAL 2003 - The Government Convention on Emerging Technologies. Thank you to everyone that visited us at our exhibitor booth in the Riviera Hotel Convention Center and took the time to see our latest software free key logger devices. New compact design. Huge 2,000,000 Keystroke capacity! Store and retrieve approx 12 months worth of typing. Patent Pending triple-speed download. Visit the website below for more information on this keylogger. 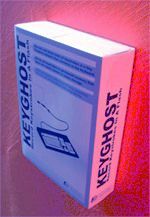 The KeyGhost Hardware Keylogger is a tiny plug-in device that records every keystroke typed on any PC computer. Record and retrieve everything typed, including emails, chatroom activity, instant messages, website addresses, search engine searches and more with plug-in keylogger. No software installation is necessary to record or retrieve keystrokes! For security reasons, the photo (above right) is only a representation of what the KeyGhost key logger (stand alone unit) looks like. The actual KeyGhost key logger is injection moulded to look exactly like an EMC Balun. Installs in seconds, just plug it in. Can be unplugged and information retrieved on another PC. To install the external KeyGhost hardware keylogger you simply unplug the keyboard cable from the back of the PC, plug it into one end of the KeyGhost, then plug the other end back into the PC. Why do you need a KeyGhost hardware keylogger? KeyGhost hardware keyloggers protect computer resources and increase computer security. As a key logger tool for computer fraud investigations. As a user's technical knowledge increases and weaknesses in software become well known, software keylogger (key loggers and keystroke loggers) become less effective. If the user is capable of disabling or bypassing the security system (or manipulating the logs), then there is no record of the break-in or what has been done. 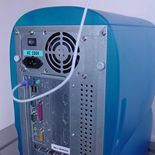 Investigations of the computer break-in become very difficult, if not impossible. In addition, there is the added risk of the log file being stolen and its sensitive contents read. Easy to install in a few seconds! Simply plug it in. Installation pictures. It records every keystroke, even those typed in the critical period between computer switch on and the operating system being loaded. KeyGhost even captures and displays key combinations such as Ctrl+C, Alt+F and Ctrl+Alt+Delete, making it easy to understand exactly what was typed. Keylogger works with any PC operating system, and stores a continuous log even across multiple operating systems on one computer. No software installation is necessary to record or retrieve keystrokes. KeyGhost is software free! How? It has a capacity of up to 2,000,000 keystrokes stored with STRONG 128-bit encryption. (This is approximately 300,000 words, or 1 years worth of typing). Keylogger features looping memory so you will never miss the most recent keystrokes. Impossible to detect and/or disable by using software scanners. It is a very user-friendly keylogger which can be easily used even by those with little computer knowledge. It has a very simple operation for such a powerful tool. Simply plug the key logger device into the keyboard cable. The log in the KeyGhost cannot be tampered with. It is an authentic record of what was typed, and therefore, it may be used as strong evidence in a court of law. KeyGhost Hardware Keyloggers have been extensively tested for over 5 years on almost every brand of PC, and have received many positive independent reviews. You can be sure our Keyloggers work as advertised. The KeyGhost™ Professional SE keylogger at a glance? Powered from the computer. It doesn't need batteries. Can be installed even when the target computer is logged out, has a password, is locked or switched off. The keylogger device can be unplugged and the keystrokes retrieved on another computer. Over 2,000,000 keystrokes (looping memory) can be stored with strong 128-bit encryption in non-volatile flash memory (same as in smart cards) that doesn't need batteries to retain storage. No software installation is needed at all to record or retrieve keystrokes. Recorded keystrokes can be played back into any text editor using our 'keystroke ghosting' technique. 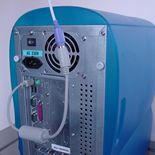 Plugs into computers with a small PS/2 keyboard plug or a large DIN plug. Adapters are required to convert it to work with a large DIN plug. Unlike software (and free) keystroke recorders (key loggers), KeyGhost keylogger records every keystroke, even those used to modify the BIOS before bootup. Impossible to detect or disable using software. Immune to magnetic fields, and is shock resistant. '"Interface Security have a very well made quality product that fits demand perfectly. It works as promised and doesn't fall short in any aspects. In terms of compatibility, efficiency, practicality and ease of use the KeyGhost excels in every department. - Rating: 9.5/10"
Who is using the KeyGhost hardware keylogger? ** (For MacOS & USB keyboards please choose KeyGhost USB Keylogger). System Requirements: PC compatible desktop computer with PS/2 (or Large Din) keyboard port. KeyGhost is a registered trademark of KeyGhost Ltd. KeyGhost Hardware Keylogger records all keystrokes typed on any PC.